Tom Smith blasted an unbeaten 92 and claimed three wickets as Lancashire Lightning moved up to third in the Friends Provident t20 North Group with a convincing 46-run win over Worcestershire Royals at Old Trafford. The allrounder smashed six sixes and shared half-century partnerships with Paul Horton and Mark Chilton as Lancashire made 170 for 5 at Old Trafford. He then took 3 for 12 as the visitors were bowled out for 124, having at one stage been 104 for 2 and in with a good chance of recording their third straight win. A blistering 54 off just 29 balls from Sri Lankan opener Sanath Jayasuriya gave the Royals a great start, but Glen Chapple claimed three wickets in four balls and Stephen Parry took 3 for 19 as they lost seven wickets for just 20 runs. Having slumped to 22 for 5 in the five-wicket defeat by Derbyshire just 24 hours earlier, Lancashire fans feared the worst when Stephen Moore and Steven Croft both fell in the opening four balls from Jack Shantry without a run on the board. But Smith and Horton steadied the ship with a 69-run partnership before Horton was caught on the boundary by Phil Jaques off the bowling of James Cameron for 22. Chilton picked up the baton and raced to 34 off just 24 balls, while Smith went past fifty for the third time in the competition this season, following sixes off Moeen Ali and Jayasuriya with two more in successive overs off Daryl Mitchell and Cameron. The pair put on 80 in just 44 balls before Chilton was run out backing up after Smith's straight drive was deflected onto the stumps by Shantry off his own bowling. But Smith went on to post his career best in Twenty20 cricket, with his 92 coming in 60 balls. Jayasuriya, who had a short spell at Old Trafford in 2007, hit four of the first 13 balls he faced for six and was dropped by Simon Kerrigan, who failed to hold onto an easy chance off Daren Powell's bowling as Worcestershire started their reply well. At one point the Sri Lankan was 30 off ten balls but Kerrigan made amends in the ninth over as he claimed the catch to dismiss the opener off the bowling of Parry. The Royals were still ahead of the rate at the halfway stage, but then fell foul of some devastating Lightning bowling as Chapple - who accounted for Daryl Mitchell, Jack Manuel and Ben Cox in a four-ball spell - Smith and Parry blasted through the Worcestershire middle and lower order. 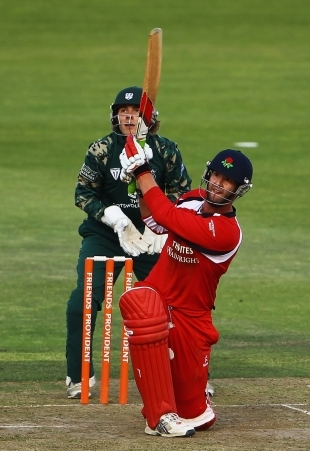 Lancashire will look to continue their march to the last eight when they host Roses rivals Yorkshire on Friday night.